Airbnb today released its annual Florida tax report, which revealed that the vacation rental platform collected and remitted over $89.5 million in tax revenue to Florida state and local governments on behalf of its hosts in 2018, up from $45.7 million in 2017. In 2015, the Florida Department of Revenue (DOR) authorized Airbnb to collect and remit the state sales tax on behalf of all 45,000 Airbnb vacation rental hosts throughout the state. As a result, in 2018 Airbnb delivered $62.5 million in sales tax revenue to DOR, as Airbnb vacation rental hosts throughout the state earned a combined $810 million in supplemental income through the platform. The $62.5 million in sales tax revenue delivered to the state is up from $33 million in 2017. Airbnb also has voluntary agreements with a number of Florida counties to allow the platform to collect and remit local bed taxes on behalf of its hosts in each jurisdiction. These tax agreements make it more convenient for local governments to collect the tax. 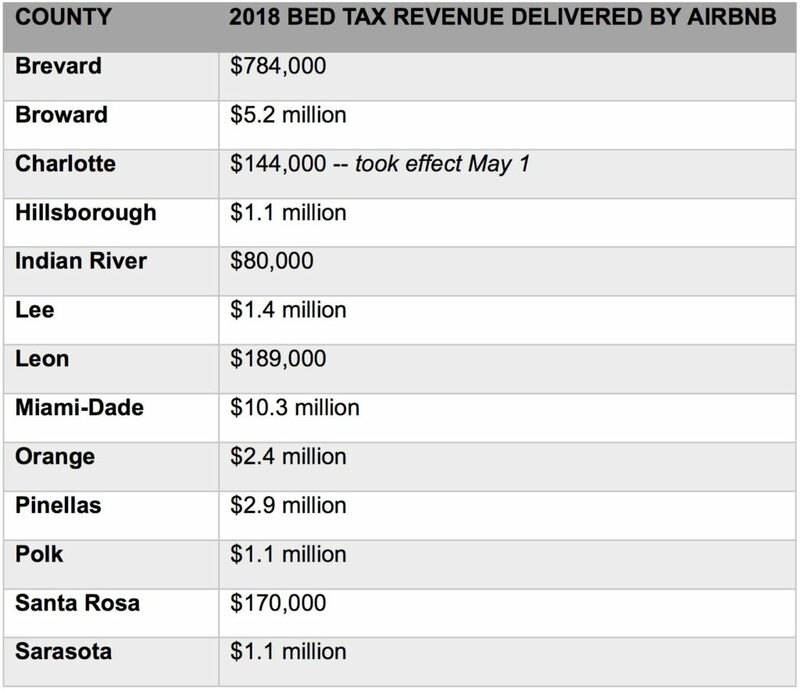 Airbnb now has bed tax agreements in place in 40 of the 67 Florida counties that assess such a tax. Among those 40 counties, Airbnb delivered a combined $27 million in local bed tax revenue in 2018. That $27 million is up from $12.7 million in 2017. Collecting and remitting hotel taxes can be complicated and it is for this reason Airbnb has worked with hundreds of governments throughout the world to collect and remit taxes, making the process seamless and easy for hosts while contributing valuable revenue for local comptrollers and tax collectors. In Florida, county bed taxes are largely used to fund local tourism marketing ventures, which means this revenue is helping counties to better brand themselves globally as family-friendly tourist destinations. The most recent state-commissioned report demonstrates that Florida hotel occupancy rates, daily prices and revenue have grown steadily even as local hosts welcomed millions of guests. This data indicates that Airbnb and its host community appear to be complementing — rather than competing with — the Florida hotel industry. This suggests that vacation rentals are opening up the state to a new slice of prospective tourists by catering to travelers less able to afford hotels, those who desire to stay in neighborhoods or cities that lack hotels, and families who prefer to be together under one roof. Airbnb is authorized through voluntary tax agreements to collect and remit bed taxes in 40 Florida counties. Below is a county by county breakdown for those that received over $80,000 in bed tax revenue in 2018. Airbnb’s 2018 Florida economic impact report can be found here.